The Philippines ended its campaign in the 2018 Asian Games basketball tournament with a dominant 109-55 victory over Syria on Friday in Jakarta, Indonesia. With the win, Team Pilipinas secured fifth place, its best finish in the competition since placing fourth in 2002 in Busan, South Korea. It was a respectable finish for coach Yeng Guiao's team that was organized less than two weeks before the start of the tournament. The Philippines took a 38-16 lead in the first half, buoyed by three surprise three-pointers from 45-year-old veteran Asi Taulava. The squad coasted the rest of the way, getting contributions from everyone in the victory. Cleveland guard Jordan Clarkson (196-G-92, college: Missouri), who secured a last-minute clearance from the NBA to play in the Asian Games, finished with 29 points to cap his international debut for the Philippines. 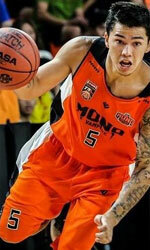 Christian Standhardinger (206-F-89, college: Hawaii) added 27 points and 15 rebounds for Team Pilipinas. The core of the team except Clarkson is expected to represent the country anew in the FIBA Basketball World Cup qualifiers, which resumes in September. The Philippines will face Iran in Tehran on September 13 before taking on Qatar at home on September 17. Guiao will coach the national team in both games in lieu of Chot Reyes, who has been suspended by FIBA for his role in the Philippines' brawl against Australia in July.